naduch chonnavarai – the Asthikas mentioned in the middle. 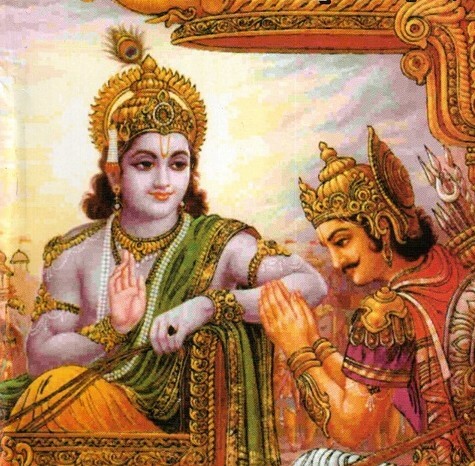 In the previous pAsuram he (maNavALa mAmunigaL) accepted that the ways of glorious ones is the reference for following, and in this pAsuram, he thinks that he should divine, for the learned ones who live based on AchAryan’s commands, about the nature of those good ones who can be trusted, qualified to accept, and who can be followed, and the nature of the opposite, bad ones who cannot be accepted, and he is talking about this towards his mind, starting the pAsuram with ‘nAththikarum’. nAththirkar – they are – those who are nAsthikas inward and outward. Aththikar – they are – those who are Asthikas inward and outward. Aththika-nAththikar – they are – those who are Asthikas outward, but nAsthikas inward. naRkalaiyin nanneRi sEr Aththikar – is – as said in ‘AsthikO dharmaAeelaScha [bhagavath SAsthram]’ (he who is interested in involving in dharmic ways told by SAsthram), he learns SAsthram as true reference which talks about dharmam and adharmam, he stays in that propriety of conduct, and conducts himself based on what is shown in it – he is such a credible Asthikar. Or, it can be said that he is an Asthika who follows the way of prapaththi, and follows means as put forth by such important SAsthram as bhagavath gIthA. Same is said in ‘AsthikanAy ivvarththaththil ruchi viSvAsangAL udaiyanAi ujjeeviththal, nAsthikanAy nasiththal ozhiya [mumukshuppadi – 275]’ (~ (there is no grey area between) living as an Asthikan with interest and faith and so reaching the goal, and, getting destroyed as a nAsthikan). Also (aruLALap perumAL emperumAnAr) divined, ‘neRi aRiyAdhAr … iRai uraiyaith thErAdhavarum [gyAna sAram – 27]’ (those who do not know the instructions of SAsthras, and who do not learn about them from the learned ones). And then there is ‘naR kalai’ that is, SaraNAgathi SAsthram, which talks about services for emperumAn only and enjoyed by/enjoying emperumAn only, and about the means for it. The ‘nal nERi’ in it is, the ways of means and destiny. For one to get this in the hands and have faith in its words, and in emperumAn (Asthikyam) – is rare. nanneRi in it is – as said in ‘thEvu maRRaRiyEn [kaNNinuN chiruth thAmbu – 2]’ (~ do not know any other god), ‘mEvinEn avan ponnadi [kaNNinuN chiruth thAmbu – 2]’ (surrendered to his (nammAzhvAr‘s) golden feet), and ‘AL pukka kAdhal adimaip payananRE [kaNNinuN chiruth thAmbu – 9]’ (My love/desire to serve nammAzhwAr as the ultimate goal materialized immediately), in which madhurakavi AzhvAr talks about subservience etc., – such state of charama parvam (ultimate state – subservience to AchAryan); nal nERi – having such ways/state. Those having such state of extreme Asthikas are rare like said in ‘Or oruvar [upadhESa raththina mAlai – 55]’. nenjE – Oh the mind which is the instrument for discerning these types and joining or leaving them accordingly! As said in ‘vittidukai kaNdeer vidhi [gyAna sAram – 30]’ (~ leaving them is commanded), leaving them with all traces of it. Now it talks about those with whom we can associate. Oh mind who knows the greatness of and likes such Asthikas! Follow their path every day. As said in ‘anuvrajAmyaham nithyam’ (I shall always follow), you live following their divine feet. So like how being with those even for one second who are to be avoided would destroy our true being (saththai), being with these (Asthikas) even for one second would be life saver (thArakam) of our true being (saththai), and since it would be the reason for life and growth (of AthmA), you at all times follow them and get true goal. Since they are having the good state (charama parvam), you also be in that state and get the true goal, by following them and worshiping them. By this, it has talked about association with amicable ones, and disassociation with opposite ones. This entry was posted in Other, upadhESa raththina mAlai and tagged 74, annan, asthigar, asthika, erumbi, erumbiappa, kovil, mamunigal, manavala, nasthigar, nasthika, pasurams, rathina, rathinamalai, raththina, raththinamalai, upadesa, upadhesa on February 8, 2016 by raghuram.